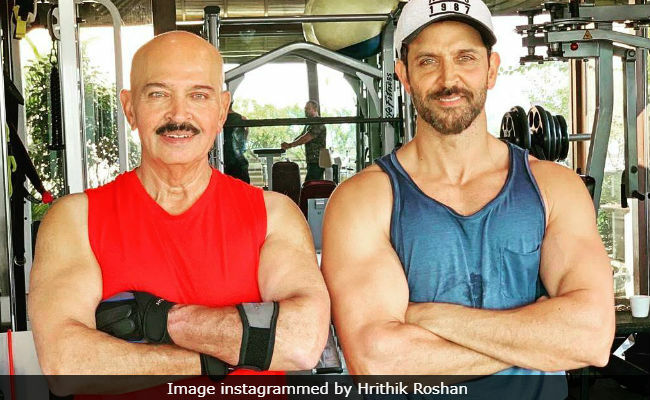 Rakesh Roshan is in "full spirits today as he proceeds to battle it"
Rakesh Roshan was diagnosed with "squamous cell carcinoma of the throat" (throat cancer) and the 69-year-old filmmaker will undergo a surgery today for the same, his actor son Hrithik Roshan shared in an Instagram post on Tuesday. In his post, Hrithik Roshan added that his father wouldn't "miss gym even on surgery day" and that he was in "full spirits." Hrithik instagrammed a picture of himself with Rakesh Roshan and wrote: "Asked my dad for a picture this morning... Knew he wouldn't miss gym on surgery day. He is probably the strongest man I know. Got diagnosed with early stage squamous cell carcinoma of the throat a few weeks ago but he is in full spirits today as he proceeds to battle it. As a family we are fortunate and blessed to have a leader like him." He launched his son Hrithik in 2000 film Kaho Naa... Pyaar Hai and they also collaborated on Koi... Mil Gaya and the Krrish series. Rakesh Roshan last produced Kaabil starring Hrithik Roshan and his next project is Krrish 4, again with Hrithik Roshan.